A word of advice to those cycling recreationally – keep pedaling. By this I mean to point out that when the rider finds the need to ride easy up an incline, even one more than just slight, the best method is to use the ratio of gears designed to keep momentum. There is no reason to turn all the gears down and ride slowly – a technique practiced by too many. 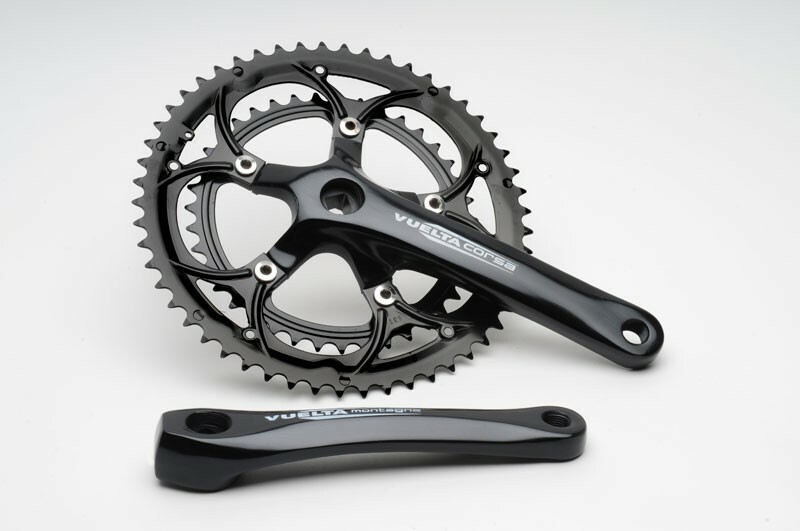 Notice the small ring on the inside of the crank – the chain-ring nearest the bottom bracket. * It’s extremely small. So small in fact, that on most bicycles, it is useless. The main bike/ride scenarios in which a triple chain ring may be necessary are on a few mountain bike rides and on long-distance touring. Really, the triple ring set-up is not even necessary on road bikes. But in circumstances of touring, the small ring is not used because of hills alone – it is used with hilly terrain + a bicycle loaded with panniers (front and rear). Otherwise, the strength of a rider who goes out even occasionally will be enough to carry the bike over most hills attempted by these kinds of riders on a set-up built around whatever the number of gears available in the cluster. Note the lack of inner ring on the crank pictured below. The chain runs between the chain rings and the gear cluster (cassette). 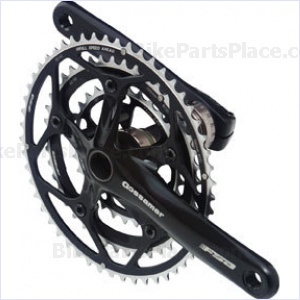 I do not mean to point out one brand of crank set of cassette type or another. I just mean to use an image to make a general point. Of the two cranks pictured above, the one on the bottom lacks the inner ring. In cycling culture, this ring is built onto some faster hybrids (flat-bar road bikes) and basically every road bike built for speed. Mountain bikes, even those built with a double chain ring crank set-up instead of a triple, have smaller teeth counts and in their gear clusters, tend toward really high teeth counts in the lowest gear (those closest the wheel). The reason for this of course has to do with constantly changing terrain that alternates between degrees of mud, loose or rocky sections and varied grading. In other words, gearing must be designed to allow the rider to confidently climb and descend on dirt. On a road bike, however, mainstream gearing of the double chain ring and a gear cluster with smaller teeth counts is arranged as such to allow (force) the rider to pedal harder…and thus travel faster. Why can’t hybrids such as comfort bikes and flat-bar road bikes arrive out-of-the-box with a double chain ring and slightly higher teeth counts on included gear clusters? These hybrids don’t need 53-39 teeth chain rings or 11-21 gear clusters of course. I am suggesting something slightly smaller than a compact road crank (a tad smaller than 50-34 teeth) with an 11-28 (road cluster designed for very hilly terrain). 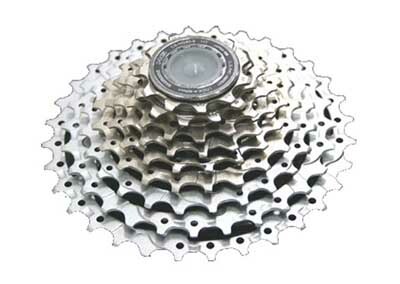 Or for some, a gear cluster more akin to a mountain bike – 11- 34 or 36 teeth. This may require the addition of a long-cage rear derailleur to handle the large gap between the smallest teeth cogs in the higher gears and the highest teeth cogs in the lower gear. But so what? Even if road riders (of which I am one) and mountain riders (of which I am also one) keep riding in technical gear-chain ring set-ups designed to handle specific technical tasks relative to each riding scenario, the majority of “Sunday afternoon” riders don’t need or want these set-ups. They don’t even need the alternative triple chain ring usually built on hybrids and nearly all kinds of recreational bicycles. They really should be riding bicycles built more closely to the gear arrangements I am talking about here – something that I will not coin as truly hybrid: HYBRID GEARING. Taking this step will swerve recreational bicyclists away from defaulting to certain types of bicycles because the addition of hybrid gearing to a diverse array of bicycle types will change how they can be used. The most important reason I suggest this whole notion to the world of bicyclists and cycling culture is because if recreational and hybrid riders drop the chain to the smallest ring on a triple chain ring (assuming the chain is in a low gear on the gear cluster), they also tend to pedal slowly in an attempt to “force” the technology of the machine to carry them up the hill. The machine is never going to carry a rider. The rider always has to pedal the bike. And in this case, not only has the rider slowed their pace to something absurdly slow, this “technique” of pedaling also makes it easier for the rider to lose balance and weave erratically because the momentum of the bicycle and its rider have slowed so much. Momentum is your friend – consistent momentum produces a more steady and safely controlled bicycle. And if the rider can just keep pedaling a little more using a hybrid gearing in a double chain ring set-up, so much the better for maintaining pace up inclines. Gone will be the days of wobbly bicycle rides. Don’t hesitate to comment here or at Twitter. *The Images above are intended as “fair use” and are not installed in the post to promote any one crank or cassette cluster or another. They are simply “quoted” from around the internet. This entry was posted in bicycle commuting, Bicycle Components, bicycling, bicycling safety.